Forty eight years have passed since cavers exploring the lower sections of Blanchard Springs Caverns made their way up a steep rocky wall and squeezed their way through a narrow opening. What they encountered was amazing, though dim lights made visible only a small sliver of their colossal discovery. They had entered what's now known as the upper, or Dripstone, level of the caverns, where the largest rooms and most spectacular formations are found! The exploration team, which consisted of four Batesville natives, had made what’s been hailed as the most important cave discovery of the 20th century. Hail Bryant, who was accompanied by Mike Hill, Robert Handford and Hugh Shell (who died in 2002), said the find was kept a secret for several weeks because they didn't really know how extensive the chamber was. "Our lighting allowed for very limited vision," Bryant recalled. "Until we rigged up a multi-flash camera system and later viewed the slides and photos, we had no idea that we had stumbled onto something very special." Shell, an ex-WWII Marine and a veteran cave explorer, learned about Half-Mile Cave in the mid-1950s. Then, the only way in and out of the extensive underground system was a 70-foot vertical shaft located about one-half mile from Blanchard Springs. Shell made his first attempt to descend the shaft in 1959 using a homemade rope ladder that proved to be too short. The failed venture, though, only increased his desire. Bryant, who started exploring caves in his teens, teamed with Shell in 1960, and the two began working on a system to more easily descend and ascend the cavern's natural entrance. Soon the gear was ready and together they descended to the floor of the middle level of the cave. Once there they faced underground river crossings, muddy passageways, gigantic rocks and total darkness. Shell and Bryant maintained a scientific approach, mapping and photographing miles of passages. Their findings were then turned over to the U.S. Forest Service, which owned Blanchard Springs because the caverns were part of the Ozark National Forest. At one time, Shell, Bryant and their teams were the only non-Forest Service personnel granted permission to enter the caverns. Often the exploration team consisted of high school and college students. "But we always had a captain in charge of each trip," Bryant said. "Those young cavers deserve much of the credit, because they worked hard for the team." The upper level of the caverns was almost discovered in 1960 and again in 1962. "We could see debris [gravel] that had washed from a small crevice at the top of a 60-foot wall of rocks," Bryant said. "Finally, in 1963, the team made it to the top and squeezed through to the upper level." After leading several news photographers, writers and Forest Service officials through the Dripstone section, the caverns gained notoriety as others witnessed firsthand the extent of its remarkable discovery. But more work had to be done. So Bryant and his team prepared a presentation and traveled Arkansas and to Washington D.C. in an effort to convince the public and government officials that Blanchard Springs Caverns were unique. "Using color slides and commentary, we had to assure people that caves like this are extremely rare, and something the public would want to visit," Bryant said. An article printed in Life magazine in 1964 featured a full-color photo layout of Blanchard's spectacular formations and brought national attention to the cave. By the time the pictures appeared, plans were underway to develop a trail through the upper chambers. When Shell and Bryant ended their studies in 1964, they had photographed and mapped about 10 miles of passageways. It took workers nearly 10 years to construct the Dripstone Trail. Great care was taken throughout, with much of the work done by hand to avoid damaging the underground environment. Low-level lighting and an air-lock door system were installed, and after 30 years of tours, they have helped keep Blanchard a "living" cave. The Dripstone Trail and the visitors center complex opened to the public on July 7, 1973. During its first season, travelers from 48 states and 29 foreign countries toured the caverns. For the first time, visitors could enjoy intriguing features such as flowing draperies, multi-colored stalagmites and stalactites, sparkling columns up to 65 feet tall, and delicate coral-like calcite on the walls of the cave. And, for the first time, they could experience the enormity of the caverns -- the largest room is 180 feet wide and the length of four football fields placed end to end. Almost immediately work started on a second tour, the Discovery Trail, which opened in 1977 and covers parts of the cave first explored. Visitors may view the natural stone shaft where the explorers descended by rope and one of the largest flowstones in the world -- some 140 feet long and 40 feet tall. Discovery is quite strenuous, with about 700 stairsteps. Designed for the physically fit, it is open only during the summer months. Those who've visited the Dripstone have been able to experience the wonders Bryant and his team discovered with relative ease. A 216-foot elevator shaft has replaced the need for ropes at the sinkhole, and concrete pathways with handrails lead the way as Forest Service interpreters provide interesting facts about Blanchard, which is now ranked among the 10 most beautiful caverns in North America. The latest Blanchard Springs Cavern tour debuted in the spring of 2000. "Wild Cave" tours are guided trips into undeveloped reaches of the cavern system. An immediate hit with the more adventurous, the wild cave experience requires that participants crawl up and down dirt slopes, squeeze through tight spots and scramble over large rocks. Those that take the wild cave tour, though, are rewarded with fantastic sights not seen on the first two tours. These tours are by reservation only. While the Shell-Bryant team did most of the important job of exploring and recording their findings, they were not the first explorers in Blanchard Caverns. In 1934, Willard Hadley, a Forest Service planner, descended the natural entrance and conducted limited excursions. Then, in 1955, Roger Bottoms of West Helena lead a small team into the caverns several times. It was Bottoms who discovered the remains of a prehistoric Native American who died in the cave some 1,000 years ago. Other facilities at Blanchard Springs Caverns include an exhibit hall, movie theater and bookstore. The Blanchard Springs Recreation Area offers scenic campsites, a fishing lake stocked with trout, hiking trails, picnic sites, limestone bluffs and the massive spring that emerges from the caverns. Some 3.09 million persons have toured Blanchard Springs Caverns since 1973. Still, it is thought by many as "one of the best kept secrets in the Ozarks." Tour reservations are advised by calling 1-888-757-2246. An exhibit on display through Oct. 15 at the Old Independence Regional Museum in Batesville features much of the original equipment, supplies and cameras used to explore Blanchard Springs. In addition to many photos made during early cave excursions, "Exploring Blanchard Springs Caverns" includes a hand-drawn map of the underground chambers and the types of gear, safety equipment, clothing and food used when exploring the cave. A portion of the original hickory log, used to lower and lift spelunkers in and out of the cave, is also displayed. And nearby, a mannequin fitted with authentic 1960 caving gear appears ready to climb into an automobile tire "saddle" for the descent into the cave. A slide-video program completes the story of exploring the caverns. Explorers Hail Bryant, Jim Buchanan, Charlie Rogers, Billy Sneed, Lester McGuffey and Mike Hill were on hand for the Aug. 2 opening of the exhibit. "Exploring Blanchard Springs Caverns" is open from 9 a.m. to 4:30 p.m. Tuesday through Saturday and from 1:30 to 4 p.m. Sundays. A small admission is charged. For more information, contact the museum at (870) 793-2121 or visit www.oirm.org. 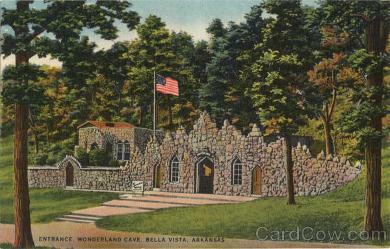 Although not open at this time, Wonderland Cave in Bella Vista, Arkansas was a sight to behold in it's day! 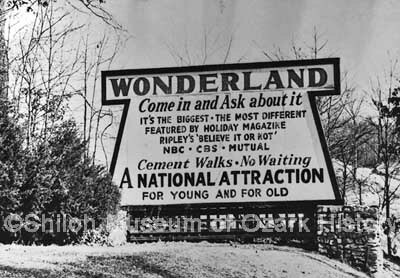 The Wonderland Cave opened to the public on February, 28, 1930. The likes of Cab Calloway and Duke Ellington performed at the cave for almost thirty years. 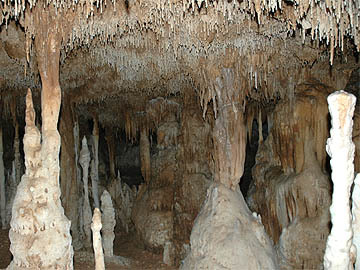 Political and social events were also held in what was known as "The Big Cave". Clarence Linebarger had seen clubs built in caves on a trip to Paris in 1929. The one acre part of the cave used for events has a large & naturally vaulted chamber with a concrete dance floor. There is an alcove for a twelve piece band, and on the opposite end a 30 foot long bar. Wooden and stone booths surround the perimeter. "The Largest Natural Place of Amusement in America" is what the sign read outside the cave. 400 people crowded into the club on its grand opening on March 1, 1930. 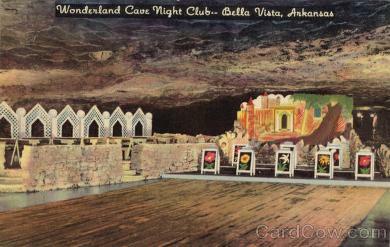 The Wonderland Cave became the largest underground nightclub in the United States. After prohibition ended, Clarence Linebarger started the Clarence Andrew Linebarger Winery in 1935. Linebarger produced 1513 gallons of wine the first year of operation. The wine was bottled and sold under the labels Belle of Bella Vista and Wonderland. The wine was stored in the Wonderland Cave. By the early 60s the cave no longer operated as a nightclub, but the public could tour it for a small fee. With the Cold War heating up, Civil Defense officials scrambled to find & create nuclear fallout shelters across America. Three of the better known cave that became fallout shelters in the area are Wonderland Cave, Spanish Treasure Cave near Gravette, and Civil War Cave in Centerton. Wonderland Cave was leased to Cooper Industries in 1965. The Linebarger heirs sold the cave in 1996. Wonderland Cave was entered in the National Register of Historic Places on January 1, 1988. As of today, the cave is not open. On October 17, 2010, a fire sparked and destroyed an abandoned home near the Wonderland Cave. The house was home in the past to the Wonderland Cave's caretaker. The Rock: Blanchard Springs Caverns is located in sedimentary rock that was laid down during the Upper Ordovician - Lower Mississippian periods (310-460 million years ago). At that time northern Arkansas was covered by a shallow sea that teemed with life. During most of the period limey sediments built up from the shells of the sea animals that died. As the layers of shells got deeper and deeper, they were compressed to form limestone rock. Periodically, there was also deposition of layers of mud and sand. These layers became shale and sandstone. The Uplift: Lower Pennsylvanian (about 310-350 million years ago). Enormous forces in the earth's crust began a gradual uplifting of the large, oval-shaped landmass that became known as the Ozark dome. During the uplifting, which was so slow that if we were living here we would not have known it was going on, layers of rock often cracked or fractured under the stress. Imagine a multi-layered cake. Now think what would happen if you started pushing the cake up in the center. Erosion: As the land raised, the surface streams flowed over the land in the weakest places producing deep valleys, sheer bluffs, and the rugged topography as we know it in the Ozarks. Creation of the Cave: (50-70 million years ago). As the surface eroded, so did cavities underground, though by a different process. Some of the rainwater percolated down through the cracks in the rock layers. As the water passed through the soil, it picked up CO2 (produced during the decomposition of organic material) to add to the CO2 picked up in the air. This formed a mild acid called carbonic acid, giving the water greater dissolving power. (A carbonated soft drink contains carbonic acid.) As the acid water came in contact with the limestone, the limestone (CaCO3) chemically reacted with the carbonic acid. In this way solutioning occurred along the fractures. Very slowly, over long periods of time, crevices became channels; channels enlarged into tunnels; tunnels joined together to form rooms, water filling the whole carved out area. Blanchard Springs Caverns is a cavity formed primarily in layers of limestone with thin layers of shale and sandstone which collapsed. The cavern cavity zone lies between Boone Formations, which are mostly bedded chert, an insoluble siliceous rock, and St. Peter Sandstone, which is also insoluble. Deposition of Clay: The insoluable residue of dissolved limestone is fine-grained clay called "terra rosa" (meaning red earth). After the springs created a drain for the cave water, the underground stream began to flow and the clay eroded or moved from place to place. It was the presence of clay near the ceiling in the Discovery Room that gave Hugh Shell and Hail Bryant the clue that there was an upper level to Blanchard Springs Caverns. Breakdown: The large piles of rock sometimes covering the cave floor probably fell as the water level in the cave dropped and no longer helped support the ceiling. The ceiling collapse continued until the ceiling achieved a stable arch where the cavern wall helped hold up the ceiling. (Think about playing building blocks and building stairsteps up one side and down the other. Each preceding block supports the next one.) It is safe to guess that over the past eons Blanchard Springs Caverns has achieved a stable ceiling. Where the trail goes, the ceiling has been tested and is monitored to insure safety. - Variations in the amount of carbonic acid. Resolutioning: Since the surface is ever changing, animals and plants are living and dying and the water may change its course as it passes through the rock, the ratio of CaCO3 carried in the water to the amount of acidity is variable. When the incoming solution is under saturated with calcite, resolutioning will take place. In other words, the calcite that has been deposited to form speleothems will be taken back into the solution and will be washed away. Speleothems that are dry and look dull and chalky (like they are covered by dried toothpaste) are good examples of resolutioning in the Coral Room. Dormancy: There are some dry speleothems in Blanchard Springs Caverns which attest to the changing course of the water. These formations are considered dormant, not just dead, because water may return one day. Our viewing of the cave is just a tiny glimpse of its life. It's like seeing one frame of a long playing movie - one frozen instant. The cave has constantly been changing in the past and it will continue to do so in the future. the colors found in a cave, especially black, brown and red. The stain of color is concentrated on the outer layers of the speleothem. As the speleothem grows, the crystal bonding structure of the calcite forces the color to these outer layers. In the very distant future: What remains for Blanchard Springs Caverns is for the surface erosion to wear the cavern ceiling thinner and thinner. Eventually, hundreds of thousands of years in the future, the cavern ceiling will collapse as a huge sinkhole. The sediment will wash in to fill the sinkhole and may obliterate all signs of the cavern system. Meanwhile more passages may be actively forming and enlarging underground and new caves may be given entrances. Ford, T.O. & C.H.D. Allingford, The Science of Speleology, Academic Press, 1976. Hill, Carol A., Cave Minerals, National Speleological Society, Huntsville, AL, 1976. Zephyrs Press, Inc., Teaneck, NJ, 1978. "The Amazing World Below" movie. "Welcome to Blanchard Springs Caverns" brochure. Cohoon, Richard R. "Blanchard Springs Caverns, Tour A - A Geological Report Concerning the Features of the Cave Significant enough for Public Interpretation'" 1968. Tony V. Field, "Geological History of Blanchard Springs Caverns," (Geology - BSC). non-technical publications prepared by the USGS to answer inquiries about a variety of the earth science subjects. How old is the earth? The earth is at least 4.6 billion years old, according to recent estimates. A great part of the evidence for this age is contained in the earth's rocks. Young Earth creationism (YEC) is a form of creationism, a religious belief, which holds that the universe, Earth, and all life on Earth were created by direct acts of God less than 10,000 years ago. Its primary adherents are Christians who subscribe to a literal interpretation of the creation narrative in the Bible's Book of Genesis and believe that God created the Earth in six 24-hour days. In contrast to YEC, old Earth creationism is the belief in a metaphorical interpretation of the Book of Genesis and the scientifically-determined estimated ages of the Earth and Universe. What scales are used to tell geologic time? Two scales are used to date the various earth-shaping episodes - a relative time scale, based on the sequence of layering of the rocks and the slow but progressive development of life as displayed by fossils preserved in the rocks; and an atomic time scale, based on the natural radioactivity of chemical elements in the rocks. What are some early geologic speculations? In the 5th century, B.C., the historian Herodotus made one of the earliest recorded geological observations. He found fossil shells far inland in what are now parts of Egypt and Libya and correctly inferred that the Mediterranean Sea had once extended much farther south. In the 3rd century B.C., Erathosthenes depicted a spherical earth and even calculated its diameter and circumference. However, less than 500 years ago, sailors aboard the Santa Maria begged Columbus to turn back lest they sail off the earth's "edge." Most people appear to have traditionally believed the earth to be quite young - that its age might be measured in terms of thousands of years, but certainly not in millions or billions. When were fossils linked to geologic time? Around 1800, William "Strata" Smith, an English civil engineer and surveyor, had a hobby of collecting and cataloging fossil shells from areas in southern England where "limestones and shales are layered like slices of bread and butter." His hobby led to the discovery that certain layers contained fossils unlike those in other layers. Using these key or index fossils as markers, Smith could identify a particular slow but progressive development of life; therefore, scientists use them to identify rocks of the same age throughout the world. Precambrian (600 million years ago and older) marking the time between the birth of the planet and the appearance of complex forms of life. More than 80% of the earth's estimated 4.6 billion years fall within this Precambrian Era. expressed in terms of an isotope's half-life, or the time it takes for one-half the nuclei in a sample to decay. The isotopes of certain elements decay very slowly. Those of potassium-40 have a half-life of 1.3 billion years. The potassium-40 method is one of the most useful dating methods available to the geologist because it can be used on rocks as young as a few thousand years as well as the oldest rocks known. What is the "Carbon-14" Dating Method? An important atomic "clock" used for dating purposes is based on the radioactive decay of the isotope carbon-14, which has a half-life of 5,730 years. Carbon-14 is being produced continuously in the earth's upper atmosphere as a result of nitrogen-14 isotopes being struck by neutrons that have their origin in cosmic rays. This newly formed radiocarbon becomes mixed with the nonradioactive carbon in the carbon dioxide of the air, eventually finding its way into all living plants and animals. After the death of an organism, the amount of radiocarbon gradually decreases through the radioactive decay as it reverts to nitrogen-14. By measuring the amount of radioactivity remaining in organic materials, the amount of carbon-14 in the materials can be calculated, and the time of death can be determined. Because of the relatively short half-life of carbon-14, the radiocarbon clock can be used for dating events that have taken place only within the past 50,000 years. of Granite Falls, Minn. The age of the rocks was calculated to be about 3.8 billion years old -- plus or minus 100 million years -- from using the rubidium-strontium and uranium lead dating methods. Rocks of comparable age have been found in western Greenland and other rocks -- 3 to 3.5 billion years old -- are known to occur in southern Africa and in the Soviet Union. Rocks older than 3 billion years probably have survived due to the continuing erosion of the earth's surface, and the "reconstruction" of rocks deep within the earth. How old are meteorites? An approximate age for the earth has been determined from studies of meteorites -- matter from space. Stony meteorites contain sufficient uranium to produce appreciable quantities of radiogenic lead, which can be used to measure their ages. Calculations yield an age of about 4.6 billion years for these meteorites. Since the earth and meteorites likely have a similar origin, it seems reasonable to assume that the age of the earth is about the same age as the meteorites. Free Amphitheater events are presented every Wednesday and Friday at 8:30 PM. This weeks July 1 subject is astronomy "Starry, Starry Night". 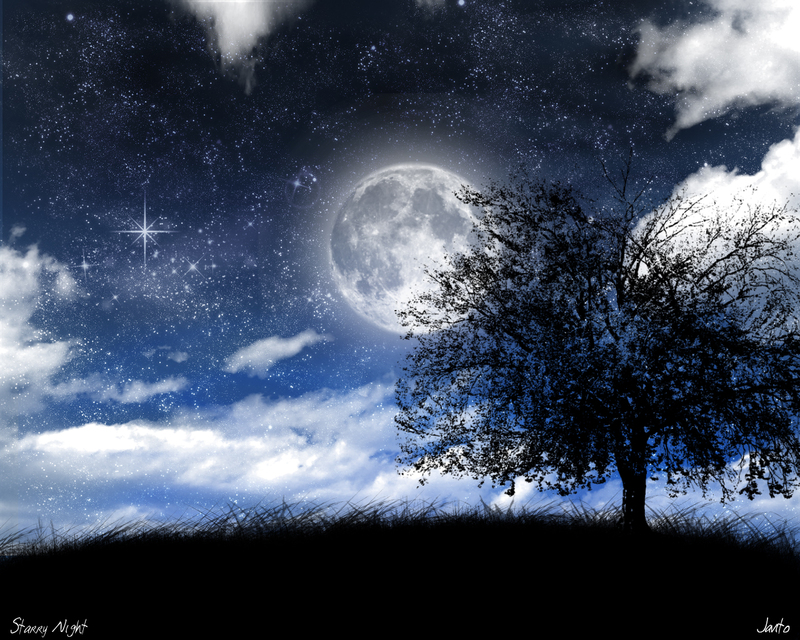 People have always been fascinated by the night sky. They made up stories to explain what they saw. Join us for a modern journey through the world of stars, constellations and planets. We'll have a program even if it's cloudy, but if it's clear bring a blanket to lie on so you can enjoy the night sky in comfort. n 2007, approximately 8,000 to 11,000 bats died in several New York caves, more than half of the wintering bat population in those caves. Cavers first noticed large numbers of dead bats around the mouth of one cave and reported it to wildlife officials in February 2006. Many of the dead bats had a white ring of fungus around their nose. 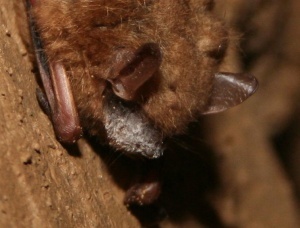 Most affected hibernating bats in the region have white fungal growth on their ears, wings or nose. This condition is called White-nose Syndrome (WNS) and is associated with high bat mortality in the northeastern United States. Today, the fungus is estimated to have killed over a million hibernating bat species in more than 15 states and 2 Canadian provinces. Little brown bats, once a common bat in the area, are sustaining the largest number of deaths. A recent Department of Environmental Conservation survey shows a 93% decline of little brown bats in 23 caves at the epicenter of WNS. 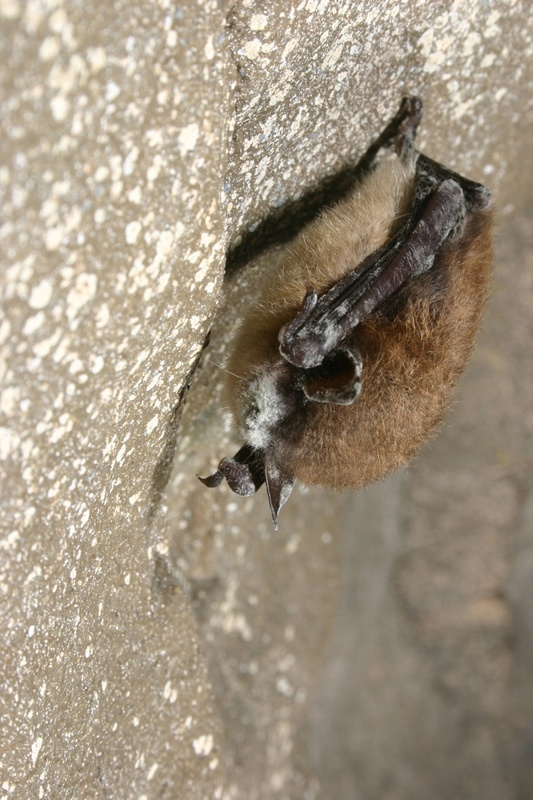 Currently five other hibernating bat species are affected by the fungus: big brown bat, northern myotis, tri-colored bat, eastern small-footed myotis and Indiana bat. The federally endangered Indiana bat has shown a decline of 53% in the epicenter caves. What is this fungus and how is it killing the bats? Thats what many bat scientists are asking themselves as well. We still dont have all of the answers. The white fungus found on the bats is a cold loving fungus now scientifically called Geomyces destructans. Dead bats with the white nose have exhausted their fat reserves and the fungus is thought to be a causing agent. Recent research has shown that WNS-affected bats are awaking as often as every 3-4 days as opposed to the normal every 10-20 days. Unfortunately, about 90% of the bats affected perish due to starvation. The bat conservation community is deeply concerned and involved in identifying the possible cause of the disease. The focus is to identify the cause of the outbreak and deaths, and to also learn how the fungus spreads. Recently WNS fungus has been found and identified in France. However it is yet unsure if the fungus came from Europe or has been transmitted from the U.S. Bat to bat transmission of WNS has been documented and a great amount of research is focusing on the mode of transmission and the cause of the fungus. Currently there is no cure for White Nose Syndrome. There is no information indicating that people have been affected after exposure to the white fungus. What is OBC doing to Help? The Organization for Bat Conservation is dedicated to protecting bats and their habitats. We have dedicated funds to support researching the fungus, providing roosting alternatives, and enhancing communication among researchers, agencies, environmental organizations, and the general public. OBC donated funds toward an experimental freezer that is being used to study this new cold-loving fungus at the National Wildlife Health Center in Madison, Wisconsin. David S. Blehert from the center presented information at the North American Symposium on Bat Research that confirmed 90% of bats submitted from the WNS-positive sites exhibited the fungal infection. The fungus is a newly described species similar to Geomyces species. Fungal cultures grew optimally between 41 degree Fahrenheit (5 degree Celsius) and 50 degree Fahrenheit (10 degree Celsius).These temperatures are similar to the conditions in caves and mines that bats prefer to hibernate within the WNS-affected region. Blehert reported that the upper growth limit for the fungus is approximately 71 degree Fahrenheit (21 degree Celsius). OBC donated 6 bat houses toward a joint study by the Indiana State University Center for Bat Research and Conservation and University of Winnipeg. The researchers want to find out if providing bats with artificial thermal roost boxes within the WNS-affected caves could slow energy expenditure during the periodic arousals and prolong survival. They demonstrated the potential survival benefits using computer simulation and showed that localized thermal bat roosts reduce mortality from over 80% to less than 25%. A test site in Manitoba, Canada that is used by approximately 400 little brown bats was chosen. 6 (six) OBC bat houses were retrofitted with thermal heating elements and installed in 2009. The study will help determine the capability of bats to find and utilize the thermal boxes. The boxes will be tested in WNS-affected caves next winter. OBC helps fund a project at Arkansas State University by Evan Lacy Pannkuk (ASU Ph.D. student). The US fish and Wildlife service has produced a draft framework for managing white nose syndrome (WNS) that emphasizes the need for a basic understanding of WNS pathogenesis and host/disease ecology. This information is vital for researchers to develop a control mechanism that may stop further devastation from WNS. In order for a fungus to be pathogenic it must first attach to a host and obtain sufficient nutrients to grow. Our study will directly address these goals by monitoring optimal growth conditions of G. destructans, the fungus that causes WNS, and we will further determine how bats provide essential nutrients for fungal growth in delicate cave ecosystems. Knowledge on the lipid types present on bat hair will help determine how the fungus attaches to the hair and shed light on how the fungus breaks down bat tissues and feeds itself. Preliminary data already suggest that G. destructans (and its close relative G. pannorum) possess protein and lipid eating enzymes. This project will measure rates of digestion of proteins on bats by WNS. Arkansas State University has supplied lab space and equipment. The end product of the research conducted at Arkansas State will be a thorough understanding of how G. destructans is able to attach and grow on bats. If necessary biomolecules of the fungus can be blocked providing tools to slow or stop the spread of WNS is an exciting possibility. In addition to funding research, OBC is sponsoring, participating in, and helping to organize local, state, and regional information-sharing meetings. 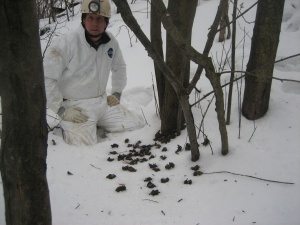 These include the Michigan Bat Working Group, Midwest Bat Working Group, and bats and mines conference. Bats are the primary predators of night-flying insects. They eat large numbers of moths and beetles. Insect-eating bats are crucial to a healthy ecosystem. Large numbers of bats dying could mean that the natural balance would be thrown off for many years to come. You should not handle bats. If you come across live or dead bats with white-nose syndrome, contact your state wildlife agency or a nearby U.S. Fish and Wildlife Service office. Cavers are asked to continue to observe all cave closures and advisories, and to avoid caves or passages of caves containing large hibernating populations of any bat species. Plant moth-attracting wildflower gardens to give bats food to eat. Leave up dead or dying trees to give bats natural shelter. Build or buy a bat house to provide adequate roosting for bats in your area. Teach your friends and family about the importance of bats. Good News! The good news is that not all bats are being affected by WNS. Migrating bats (red, hoary, silver, etc.) have not been found with the fungus. Some colonies of big-eared bats living in the same caves as affected little brown bats have not gotten the fungus. This may be because they hibernate in a slightly warmer part of the cave. Some European bats have been found with the fungus but do not seem to be harmed. Researchers are working day and night, winter and summer, to find a way to slow or stop the spread of WNS.